Hinweis: Dieser Inhalt ist eine Pressemitteilung des Herstellers. Planet 3DNow! prüft weder die Richtigkeit der Angaben noch die Art der Formulierung. Pressemitteilungen können subjektiv sein und geben nicht notwendigerweise die Meinung der auf Planet 3DNow! schreibenden Autoren wieder. 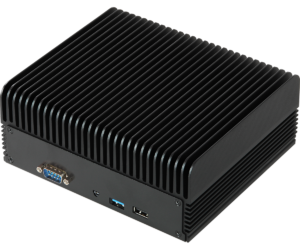 Taipei, Taiwan (April 16, 2019) ASRock Industrial Computer, the world's leader in Industrial PC motherboards, is proud to announce the iBOX-R1000, a turn-key rugged embedded PC built to be flexible and adaptable to a wide range of industry applications, including AI edge computing, vision applications and industrial IoT solutions. 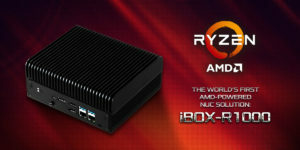 The iBOX-R1000 is the first AMD-powered NUC 4"x4" form factor solution in the world. It is a cost-effective and high-performance embedded, fanless computer for industrial applications powered by the robust AMD RyzenTM Embedded R1000 SoC. It runs on Microsoft Windows 10 and Linux kernel 4.18 and above. The Ryzen Embedded R1000 SoC supports dual channel DDR4 2400MHz and also ECC memory SO-DIMM up to 32GB. There are two ports for DisplayPort 1.4 and one for HDMI 2.0 output that can display three separate screens at the same time or be configured to one large screen. In addition, 4K video output is supported. ASRock Industrial's iBOX-R1000 comes in a ruggedized, metal chassis and employs a 25W fanless design for the toughest environments up to 50°C. It has two RJ45 Gigabit Ethernet ports, one USB2.0 and three USB3.1 connectors, one COM port for RS-232/422/485 and a power jack for the 12V adapter (included). LEDs indicate power on/off and HDD activity. Inside the housing, there is one M.2 (Key M) to support SSD (2242 & 2260), one M.2 (Key E) 2230 for WiFi and Bluetooth, and one 2.5" HDD/SSD space. "We are proud to be the first company in the world to design a NUC 4"x4" form factor computer with an AMD processor," said James Lee, General Manager of ASRock Industrial. "Our expertise in designing small form-factor computers combined with the multiple features of the AMD Ryzen Embedded R1000 creates the perfect product for applications from Digital Signage to Arcade Gaming and Gambling, Kiosks, IoT Gateway and Thin Client Terminals." 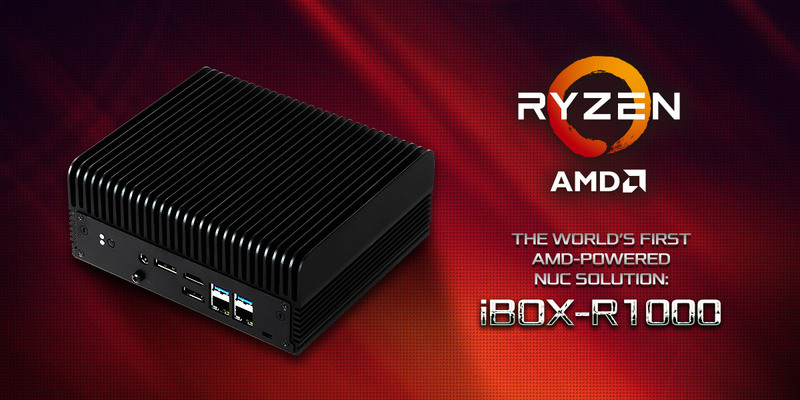 "We're excited to partner with ASRock Industrial to introduce the iBOX-R1000, the world's first AMD based NUC 4"x4" form factor computer, built on the all-new AMD Ryzen Embedded R1000 SoC," said Stephen Turnbull, director of product management and business development, Embedded Solutions, AMD. "Leveraging the high-performance of Ryzen Embedded R1000 and AMD's full suite of embedded solutions, we look forward to our continued collaboration with ASRock Industrial." ASRock Industrial Computer was established as an independent company in July 2018, focusing on the fields of motherboards, edge computers and cameras, and other products for the manufacturing, business and retail industries. It is the world's leader in Industrial PC motherboards, with customers located around the globe. Previously, it had been a business unit of ASRock Inc. (est. 2002) which was set up in 2011. By becoming an independent company ASRock Industrial can devote all its resources to B2B activities. Our products serve the Commerce, Automation, Robot, Entertainment and Security industries. With a core R&D design team of almost 65% of total staff, ASRock Industrial has the resources to develop reliable, leading-edge products for your business needs. All products can be bought off-the shelf or customized to the demands of OEMs/ODMs. Ich glaube das könnte mein neuer Router werden.